The University announced in mid September that The Harvard Campaign—launched publicly a year earlier, with $2.8 billion of gifts and pledges in hand—had realized an additional $1.5 billion of commitments through the end of the fiscal year, June 30, 2014, having raised “more than $4.3 billion” toward its goal of $6.5 billion. That brisk fundraising pace coincided with the launch of individual campaigns by the Harvard School of Public Health (HSPH), the Faculty of Arts and Sciences (FAS), the Radcliffe Institute, and others: the kind of events that often focus gift-giving. 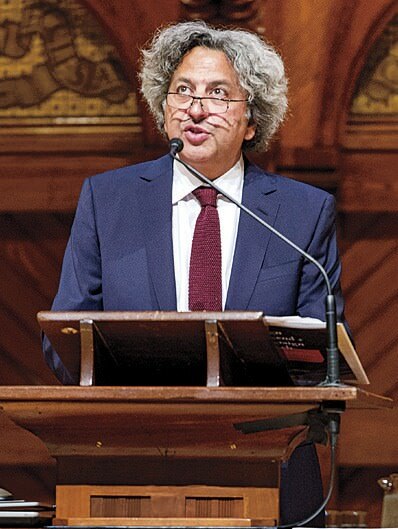 By the end of the fiscal year, Harvard Business School had recorded $721 million in gifts and pledges—up from the $600 million-plus announced during its launch gala in late April. By late summer, FAS had exceeded $1.4 billion in gifts and pledges toward its $2.5-billion goal—up smartly from the $1 billion secured when its public campaign began last October. Even the eye-opening $4.3 billion total as of June 30 understated the robust results: it does not include the Chan family’s $350-million endowment gift to HSPH unveiled in early September (see “Propelling Public Health,” page 32). • Kennedy School construction. Harvard Kennedy School took plans for an ambitious, complex, 77,000-square-foot addition to and renovation of its campus before the Cambridge Planning Board, as this issue went to press. 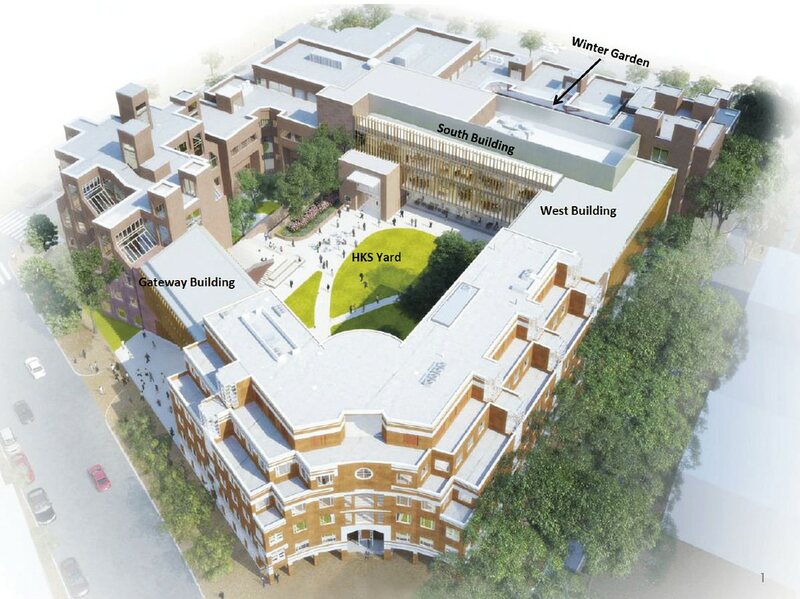 The $100-million-plus project—making three additions to current structures, including a bridge over the Eliot Street vehicular entry to link the Belfer and Taubman buildings; raising the elevation of the courtyard; and, as a result, expanding the campus’s square footage by nearly one-third—was signaled as a campaign priority during the school’s launch event last May. Robert A.M. Stern Architects LLP, responsible for the Business School’s Spangler Center, did this new design, too. Construction is envisioned from mid 2015 to late 2017. • Other public-health priorities. Soon after HSPH revealed the Chan family’s endowment gift, the school announced a $24-million gift from entrepreneur Murat Ülker of Istanbul to establish the Sabri Ülker Center for Nutrient, Genetic, and Metabolic Research, focused on ailments such as diabetes and heart disease. The center (honoring the donor’s late father, who founded Yıldız Holding, a multinational corporation based in Turkey) will be led by Simmons professor of genetics and metabolism Gökhan S. Hotamisligil. • Researching health policy. At the Medical School, which unveils its campaign in November, the department of health care policy launched its Health Care Markets and Regulation Lab to investigate high-quality, financially sustainable care. A $9.96-million grant from the Houston-based Laura (Elena Munoz ’94) and John Arnold Foundation helped initiate seven projects on payment reform, care exchanges, and other subjects, beginning on October 1. Schaeffer professor of health care policy Michael Chernew leads the effort. John Arnold was an energy trader at Enron before operating his own hedge fund through 2012. Amid this news, the Graduate School of Design and Graduate School of Education launched campaigns during the second and third weeks of September; highlights follow. As to the future? Professional fundraisers, ever fretful, caution that past giving does not guarantee future success. That said, the campaign’s alumni leaders are robust optimists. At the September 2013 launch event, Corporation member and campaign co-chair Joseph J. O’Donnell ’67, M.B.A. ’71, a seasoned rainmaker, was openly confident that “we’ll exceed” the goal. At the current pace, the campaign would need to raise about $550 million annually to meet the target during the next four years—a level of giving below that reported in fiscal years 2009 and 2010 ($597 million in each year), during the height of a financial crisis and deep recession that pummeled stocks and private-equity and hedge funds—the assets from which most major gifts are made. Now, those markets are in a period of extended boom (see recent investment returns by asset class for the endowment in “Close to Par,” page 32). In its appeal to donors, as well as in its timing, The Harvard Campaign appears to be on a formidable roll—and a record-breaking pace for higher-education fundraising. For details on the campaign’s overall progress, see harvardmag.com/campaign-15; on the FAS deanship, see harvardmag.com/dean-14. Complete coverage is indexed at http://harvardmagazine.com/topic/capital-campaign. The campaign focuses on five academic “areas of impact”—energy and environment; urbanism and citymaking; technology and engineering; globalism and society; and art and culture—where the GSD expects to shape city-building and design, in part by collaborating with other Harvard faculties. Those substantive foci map on to three financial goals. Enhancing global impact (in an already very international faculty and student body) requires funds for long-term research and travel to studios around the world. Capacity at home includes support for expanded faculty and student cohorts, the new architectural studies track for undergraduates, and renovation of Gund Hall and construction of a complementary five-story “research tower.” The final aim focuses on student aid, to reduce debt and enable graduates to pursue careers without the narrowing constraints of paying off loans. The school announced it had already raised nearly $70 million toward these ends (including half from the unexpected Evergrande Group gift, reported last spring but undisclosed in size, to endow the new Center for Green Buildings and Cities). Speaking about the GSD’s academic ambitions and programmatic connections across the University, President Faust said, “Design is in everything we do. Design infuses Harvard.” For a complete report, see harvardmag.com/gsd-14. The Harvard Graduate School of Education’s (HGSE) daylong campaign celebration was designed to bring joy to the heart of any student: classes were canceled on September 19, and Appian Way was closed off for revelry. Dean James E. Ryan highlighted what he called “a unique confluence of need, opportunity, and interest”—an apt characterization of the appeal of, and anxieties over, such challenges as closing school achievement gaps; applying new discoveries about learning; deploying technology in teaching; and assuring access to education, in the United States and internationally. U.S. secretary of education Arne Duncan ’86, reflecting on HGSE’s proposed undergraduate teacher-training program, urged his audience “to try and make sure your teachers reflect the tremendous diversity of our nation’s children. I worry about the growing disconnect between what our teachers and our administrators look like, and what our students look like. Harvard can be part of the solution there.” Worthy though education reform is, he warned, “This work is not for the faint of heart.” Given the human stakes involved in schooling, one renowned reformer, Harlem Children’s Zone founder Geoffrey Canada, Ed.M. ’75, L.H.D. ’01, said, “Changing public policy is a full-contact sport,” because the education sector can be uniquely resistant to change: “If you try to do something, the system is determined to stop you.” In other lines of work, people guard their innovations jealously, but in education, “Nobody wants to steal a great idea from someone else,” Canada declared, speaking to school districts’ reluctance to try new approaches. Although education can be just as data-driven as the tech industry, he pointed out, other businesses have a higher tolerance for risk, and more patience with setbacks while a new product is being perfected. After eight faculty members highlighted their research, from simplifying college applications to improving literacy, President Faust spoke about the school’s role in cultivating “explorers,” especially crucial because “The work of education is more scrutinized and sometimes downright assailed than ever before.” That, she said, made HGSE “quite possibly…the grittiest place at Harvard.” “Explorer-in-chief” Ryan then debuted the campaign tagline, “Learn to Change the World,” suggesting that education was “the only sure path” for world change; that, at HGSE, anyone could learn how to make a difference through education; and finally, that the school’s community would change the world of education itself. The campaign’s “three Cs” for change include cultivating world leaders and innovators (through financial aid for master’s and doctoral students; the new Harvard Teachers Fellows program aimed at the College; expanded online and hybrid learning; and research fellowships); collaboration on questions that matter (through research funding, aggressive replacement hiring for retiring faculty members, and growth in new disciplines such as neuroscience); and communication (with the vast population of practicing education leaders, bridging academia and practice both in the field and at modern convening facilities on campus). Of the $250-million goal, some $111 million is already pledged. Ryan noted, “We have to appeal to those who may not have any formal connection to the Ed School or even any formal connection to Harvard.” He must have been encouraged by a sign that seems promising not only for his enterprise, but for the larger University. 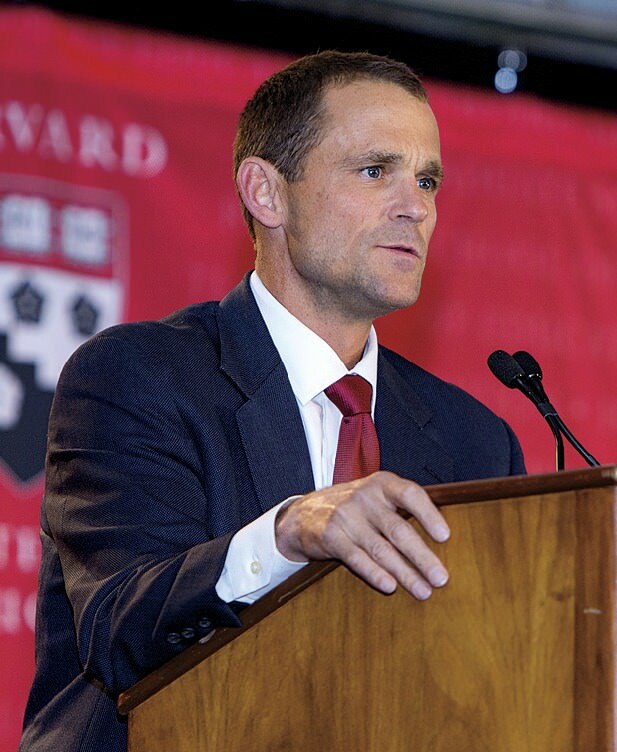 Ralph James, M.B.A. ’82, executive director of external relations at the Business School, who has his own campaign to run, has stepped forward to co-chair HGSE’s fundraising drive. Leading to change the world, so to speak. For comprehensive coverage, see harvardmag.com/hgse-14.